My 9th graders have only about 2 weeks left with me before their final exam. Most of them will move on to Algebra 2 next semester, so my strategy with them has been 2-pronged: ensure we are produtive with new material and put them in a “happy place” to make a seamless tranisiton to Algebra 2. With a unit review today, and a pre-holiday-break quiz Monday, this was a perfect time to test-drive the new FREE PolyGraph activity from my friends at Desmos, along with the awesome work of Dan Meyer and Christopher Danielson. The Parabola activity sounded perfect for my class, though there are also activities featuring linear functions, rational functions and hexagons. My freshmen have limited understanding of quadratic functions. While we have encountered some useful vocabulary regarding parabolas in my class (intercepts, vertex, domain and range), these students have not had a formal unit in graphing them yet. I was curious if students could transfer what they already knew to a new scenario. I was tempted to do a quick review of vocabulary before sending kids to the lab, but thought better of it. I want gut reactions. In the activity, one student acts as the “picker” and chooses 1 parabola from a set of 16. The “guesser” then asks yes or no questions to help narrow down which parabola was chosen. “I don’t know” is also available as an option, if the question is not clear. Between games, students are given challenges to help guide their understanding of vocabualry and “good” leading questions. I found these “intermission” questions to be extremely helpful, and noticed that the quality of the questions students asked improved after participating in them. Some obeservations about my students in this activity, which we did for about 30 minutes. Students didn’t have vocabulary to describe parabolas which “open up” (a>0) versus those which “open down”. The question “is it a smiley face or a frowny face?” was used by more than one student and led to some side discussions of what this meant. Students also recognized that parabolas could have different widths, and describing the differences between these was more challenging. Questions like “Is it wide?” or “Is it narrow?” are helpful for identifying some extreme curves, but without a baseline for what a “regular” curve looks like, this leads to some confusion over which parabolas should be eliminated. In the first round, few student mentioned the x or y-axis in their questions. Later, I noticed these became valuable tools for elimination. 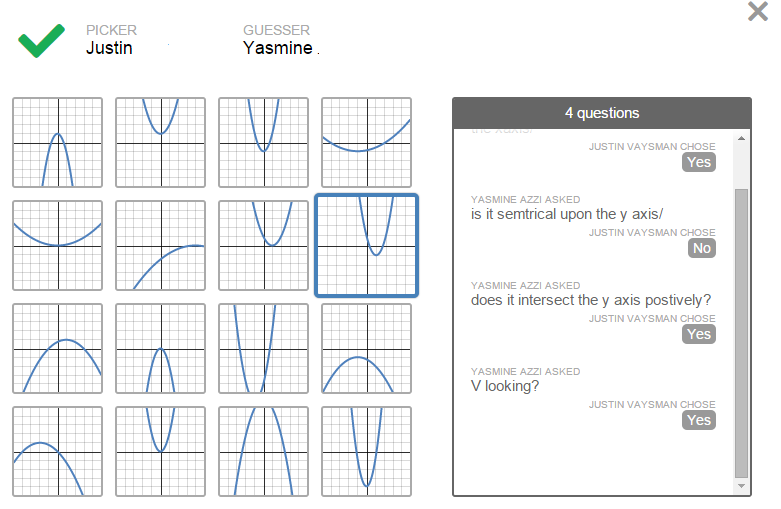 Questions which attempted to use the vertex showed mixed success. “Is the vertex positive?” is unclear, but these attempts improved with more game plays. Similarly, attempts to describe domain or range often needed more work. Students can be sneaky, and mine are no exception. Some students attempted to bypass mathematical conversation by asking “Is it in the top row?”. Nice try – until they realize the parabolas are mixed up. Also, sometimes students were assigned to play against students sitting right next to them. Not ideal, but workable. Here’s where I would go with this, if my next unit was on a formal discussion of quadratics: copy the student-developed phrases like “smiley face” nto a document. As we encounter those ideas formally in graphs, develop more math-specific language, match them up with the student descriptors, and improve the document. I want students to take ownership of their descriptions, and allow for their self-generated language. Hopefully, this builds richer connections to the vocabulary. At the end of each class, I had students complete a Google Form evaluation. I appreciate the feedback from students who took this task seriously! What did you enjoy most about this activity? This activity was really really FUN!! I liked it because I was able to interact with my classmates. I had fun as well as learn. It was interesting to see the language people used to describe the graphs. i really liked that it was an interactive activity that we could do with our class mates. It really allowed us to think about math in a fun way! How did this activity increase your understanding of parabolas? I learned that a “smiley face” is positive and a “frowny face” is negative. these math terms will probably be useful. It forced me to think mathematically and use many math terms to figure out the answer. Down the road, I think it could be fun to have one class code and invite students from a number of schools to join in. Knowing that their partner was somewhere in the room caused some goofy behavior, and I wonder how much more focus they would have if their partner was from a different school. In the end, I appreciate this activity because it is fun, forces students to think mathematically, and has clear entry points for class discussion after leaving the computers. Finally, can we have students use their already-existing Desmos accounts for logging in? I like that the data from all students is shared with me, and would be even better if their activity data is all in one place. Awesome job team! This entry was posted in Algebra, Class Openers, Technology. Bookmark the permalink. Now they think that parabolas are all different, is it the time to let them find out that they are all the same shape ?